Although I didn't really get to use the AUv3 version much, because the GUI is black and only the knobs appear. I wasn't expecting the GUI to be optimized yet as the 11 inch model is a new screen size, but the pops and crackles are pretty relentless. Interestingly though, other AUv3 apps that have not optimized for the new screen size appear fine in AUv3 format. One of the main reasons I bought the iPad is because of these great apps. Looking forward to see what the A12x chip can handle once this gets resolved. I have the same problem with model d on my new 12,9 ipad pro. Tried reinstalling, but it didnt help. Same problem in both AUM and Cubase, with no bitmap in the background. Tried rebooting with 120 hz turned off, and appactivity in background turned off. The same problem there, but i could open 6 instances model d Audio units without cracking, I can really see the potential. Please take a look on it, I love the app. I have the same issues, but with Beatmaker 3 as AU host. The only way to get anything done seems to be using a 1024 sample buffer size. Hoping for a fix. I have the same issues with the 11" and the 12.9" IPad. I love the sound of the apps but on the new IPads they are unusuable. Why is there no reply from moog? Are you guys working on it or no interest? krakra wrote: I have the same issues with the 11" and the 12.9" IPad. Apparently it’s an iOS bug, fixed by Apple with iOS 12.1.3 (beta). I’d still appreciate app updates, though. Both Model D‘s and M15‘s AUv3 user interfaces are currently broken. Sorry for the delay in replying, we've been hoping to get this sorted quickly and have been on top of it since the very first day we received our 2018 iPad Pros. We're still waiting on Apple to release the fixes that are necessary. Most of the crackling on the latest iPads should be resolved in the upcoming iOS 12.1.3 update. Note that in our testing, we're still finding some USB devices that behave correctly with older iPads, but that crackle with the latest 12.1.3 beta. We're in touch with Apple in the hope that they can properly support these also for the newer iPads. 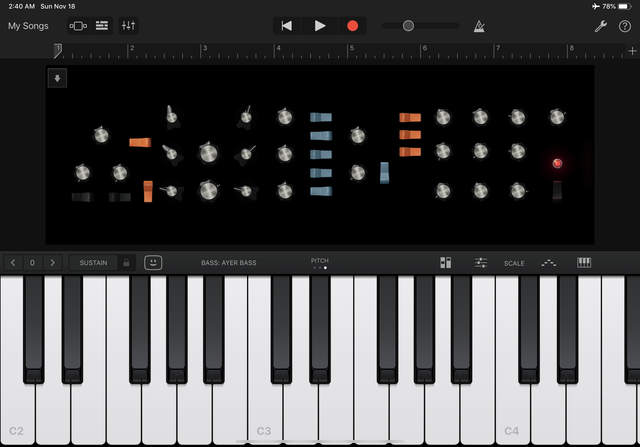 We're imminent to release a Minimoog Model D update that supports all the new screen sizes for iPad and iPhone. We've been finished with that UI work for Model 15 for weeks, but a bug in Xcode 10.1 prevents us from releasing. If we let this version out, AUv3 usage of Model 15 will be frequently killed. This is due to how Apple has changed how the memory usage is calculated. The maximum allowed limit is reached very quickly now, causing iOS to kill the AUv3 instance. We've been in touch with Apple engineering about this in the hope that this can be addressed in the near future. We've not been able to find any workarounds for this. gbevin wrote: Hope that helps. Although, it does look a bit weird in Beatmaker, see attached screenshot. Is this expected behavior? Well, let’s hope that Apple gets its act together soon. Yes, that is expected behavior. The Model D UI is not scalable. The graphics aren’t already full screen on the standalone version? How much more pixel real estate is the new generation of iPad Pro compared to the original version I have? The 12.9” iPad Pro 1st gen shows full screen width. Yay, the Model 15 update is out and everything seems fixed :) Thanks @gbevin! The problem is happening on the app as it is not getting supported properly on the iPad and the app is also lagging. I am not being able to play the app on my iPad Air and I have reinstalled it but the issue remains the same.